Immediately after a job interview you can follow a few simple guidelines to make sure you conduct your interview follow up in a professional and confident manner. This is an essential part of the interview process and many candidates neglect to take the necessary steps after the job interview. You can set yourself apart by being the candidate that does follow up. Set yourself apart from the competition with these simple follow up tips. Handle the next stage after the interview properly and increase your chances of job search success. 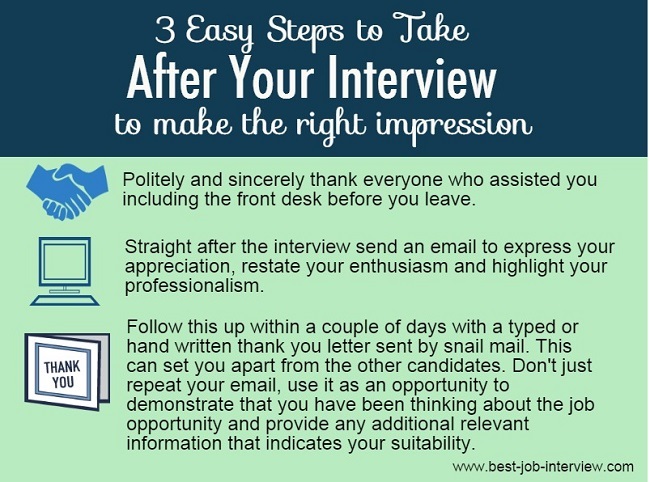 Take these 5 easy steps after your interview. You need the interviewer's name, title and contact information. If you have not got the interviewer's business card at the end of the job interview you can ask the receptionist for this information on your way out. You can also phone and get the information straight after the interview from either reception, switchboard or human resources. You need these details to send your interview thank you letter. Customize your interview follow up letter to each situation. You can select from these sample interview follow up letters. As soon as possible make notes about the position, company and what was said in the job interview so that you don't forget any important details. You need this information for a number of things. You will refer to it in your thank you note. You will use it when evaluating and making a decision on a possible job offer and when negotiating the employment offer. Think about what went right and what went badly in the interview. You can use your thank you letter and follow-up to recover from any potential problem areas and to emphasize your suitability. If you are working through a recruiter you should call the recruiter immediately after the interview to give feedback. Find out what they expect you to do next. If the interviewer has requested any information or documents from you, make sure these are delivered as soon as possible. Your thank you letter can accompany them. For the sake of speed you can send a follow up email. Then comes the tough part - waiting for feedback from the company. Use this time productively. Continue with your job search, send out your resume to other job opportunities and optimize your chances of success. Conduct proper and professional follow up after your job interview and stand out as an excellent job candidate.